If you’ve ever had the opportunity to use a commercial kitchen facility, you know how much nicer it is to work with a professional-quality sink. You have more reach, more power, more flexibility and rock-solid hardware behind you. Thankfully, with the best industrial-style faucets, it’s possible to get all those things at home! In this guide, we’ll walk you through the wonderful world of commercial kitchen faucets. We’ll explain how to find the best commercial-grade fixtures for your home kitchen without breaking the bank, and we’ll show you all the models we currently recommend! Read on to see all the commercial-grade models we currently recommend for home chefs, and to find out which one is the best fit for your kitchen! The Kraus Bolden is our recommendation to any buyers who are after industrial-style design and commercial-grade build quality in a package that won’t break the bank. It’s very affordable, but includes most of the same quality, functionality and class as our more expensive recommendations. It has the same basic design and functionality as much pricier options. It has a pull-out sprayer with lots of reach, a dual-mode nozzle that toggles back and forth between settings, and a single control knob to adjust flow and temperature. It’s the best industrial-style, pull-out option for folks with tight clearance requirements. At 18”, it fits easily under most cabinets and shelves. This one’s great if you want versatility and reach without having something massive. It’s not cheaply-made, despite the fact that it’s relatively inexpensive. This one’s solid metal, aside from the spray button, and it’s loaded with a ceramic cartridge, just like the premium options. It’s covered by the same lifetime warranty as our most expensive recommendation, which costs twice as much. You can get it in a wide range of finishes. There are chrome, stainless, and matte black options, plus a few combinations. They all look great–especially when you consider the price. It doesn’t offer as much range as the more expensive pull-out models we’ve recommended here. It doesn’t provide as much clearance, either. Having said that, the lower 18” height may be an advantage in homes where there’s cabinetry above the sink. It’s not as water efficient as premium models like the Moen Align. It still meets current efficiency regulations, but you’ll definitely use more water than you would with a pricier model. The Moen M-Dura is quite different from the other models we’ve recommended in this guide. We suggest it to anyone who wants an industrial-quality fixture in a more traditional, simplified design. It doesn’t have any fancy features, but that’s its appeal! Get this if you want a rugged, simple sink faucet for your kitchen. It’s extremely simple, with few moving parts. That makes it more durable and much easier to clean. The coils on our other recommendations can take some time to get spotless, but you can wipe this one down completely in just a few seconds. While it doesn’t have as much flexibility as our other picks in this category, it still offers lots of clearance and a swiveling base. It’s practical without having nearly as many moving parts or features. It looks good. This one’s dead simple, with clean lines and a classic design. If you’re going for a minimalist aesthetic, you’ll love this. There’s no sprayer on the M-Dura. You can certainly add one separately, but most industrial-style fixtures have one built in. It’s much less flexible than our other recommendations, despite the fact that it costs as much as the Kraus Bolden. The lack of a pull-down nozzle and extension hose make it pretty rigid, if still workable. Overall, while this is sleek and has a nice finish, it’s fairly utilitarian. The color-coded handles might not match the look you’re going for in your home kitchen. It’s only covered by a 5-year warranty, not a lifetime policy. That’s because it’s intended for commercial installations, but still a disappointment on something so expensive. 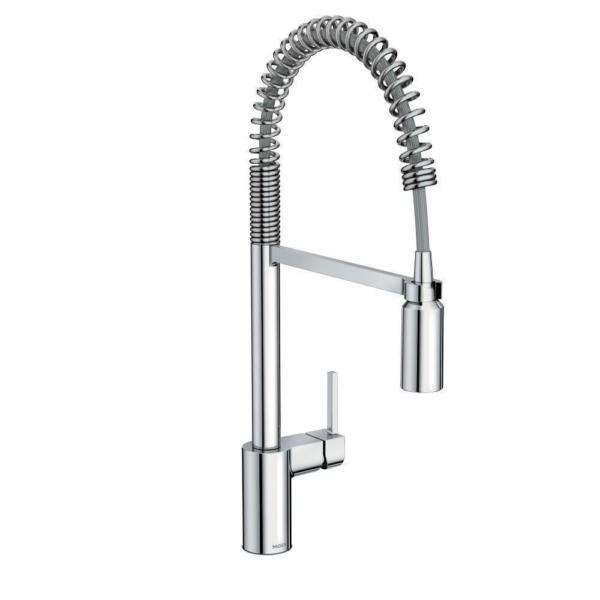 The Kraus Nola is our recommendation to most buyers who are after an industrial-style kitchen faucet. It’s an ideal balance of value and quality. Unless you can afford to spend significantly more for the Moen Align, we think this is the best commercial option on the market right now. We love the look of this one, which is rather unique. It has some curves and added grace notes, which make it fit better with more traditional design elements. It’s a good alternative for buyers who want something industrial-style without going for all hard edges.You can get it in both stainless steel and chrome. It has all the functionality of the Bolden, with a pull-down, dual-mode sprayer and spring coil hose. The Nola also adds an inch and a half of height, meaning you get even more clearance in the sink and slightly more reach with the sprayer. There are a lot of small upgrades that make this one worth the extra investment over the Bolden. It has a magnetic docking system on the spray head, plus a resilient, more elegant double-coil spring on the extension hose. It works with 1-hole and 3-hole sinks (though you’ll need to buy the optional escutcheon to go for the wider option). It’s covered by a lifetime warranty, and has an excellent reputation for long-term performance. There aren’t as many finish options as on the Kraus Bolden or Moen Align. It’s less effective than the Moen Align at using the water that comes through. This is still a great faucet, but the Moen is an absolutely stellar water-saver that really makes the most of every drop. The difference isn’t earth-shattering, but you can definitely move a lot faster with the Moen. Our ultimate recommendation in the commercial category is this Moen Align model. It’s the epitome of class and functionality in an industrial-style design. The Align is solid, elegant, and extremely flexible. We recommend it to anyone who can afford it and justify the investment. It’s more efficient than the Kraus options. This one is the most water-efficient commercial model we’ve reviewed! What’s particularly impressive is that it doesn’t sacrifice performance for economy. You can rinse quickly and powerfully with this one. The Moen looks stellar. It’s not as sleek as the Nola, but the clean lines and simple aesthetic fits well with most contemporary furnishings. The finishes are flawless as well. While it’s expensive, it’s not exorbitant. You do get what you pay for, and none of the finish options should cost you much more than $300. It comes in a few finish options: chrome, matte black, and stainless steel. As with our other recommendations, it’s covered by a lifetime warranty. It’s quite pricey, compared with our other recommendations. At 22.5” in height, the spout neck on this thing may not fit in every kitchen. Make sure you’ve got enough clearance before buying it! Now that you’ve had an in-depth look at all the industrial-style fixtures we recommend, let’s figure out which is the best fit for you and your kitchen! If you’re looking for commercial quality and flexibility on a budget, the Kraus Bolden is the obvious choice. It has the same basic design as our more expensive recommendations, and comes in a refreshingly wide range of finish options for an inexpensive model. The Moen M-Dura is our recommendation to anyone who’s looking for a commercial-grade fixture that doesn’t follow the pull-down design that all our other picks share. It’s dead-simple, but if that’s what you’re after then you’ll absolutely love it. It’s rock solid and should last practically forever. The Kraus Nola is our recommendation to most buyers in this category. It offers an excellent balance of quality and value, in a more refined package than the Bolden. Finally, if you’re not on a tight budget and want the best of the best in an industrial-style kitchen faucet, we suggest the Moen Align. It’s quite pricey, but offers top-notch build quality, functionality and looks. Industrial-style kitchen faucets don’t have to cost a fortune, thankfully. Having said that, they do cost a bit more than your average domestic fixture. Plan to spend anywhere between $150 and $300 for something high-quality that really deserves the “commercial” moniker. Before you start considering any specific models, make sure you give some thought to how much you can afford to spend, and how much you can justify investing in your kitchen. Chances are, if you’re shopping for something in this category, you’re a passionate home chef. If so, it makes sense to spend as much as you’re able for something that will make your life a lot easier. However, if you’re not able to make a big investment right now, don’t worry! You can easily find something functional, classy, and reliable for less than $200. Make sure you get a good sense of your space before you begin shopping. As with anything you buy for your kitchen, you want your new industrial-style faucet to be a good fit! If there are cabinets or shelves above your sink, make sure you measure and note the clearance so that you don’t buy a fixture that’s too high. Likewise, make sure you know how deep your sink is, and how much range you need from your sprayer. Having all these measurements handy while you read this guide will help you to narrow down your options and find the best fit for your home. A kitchen faucet is always the centerpiece of the kitchen, and that’s never truer than in the case of industrial-style fixtures! They’re big, eye-catching pieces, so you want to make sure that your new one makes the right statement. Consider the finish on your sink and on your appliances. You want to make sure your faucet matches and doesn’t clash. You can also think about design elements such as curves and lines. The more you pay for an industrial-style kitchen faucet, the more elegant your options will tend to be. The least expensive options are quite utilitarian, so bear in mind that there’s an aesthetic advantage to spending a bit more money on your new fixture. Before you make any final decisions, make sure to check the specs on any fixture you consider! These include water usage, materials, and measurements. Water usage for these fixtures tends to range between 1.5-1.8 GPM. The more you pay, the better efficiency you can expect. You should also make sure that all the finish options are made from solid brass (not coated plastic). Chrome options can be deceptive, so always double-check them! We hope our guide has given you all the information and expertise you need to choose your ideal commercial kitchen faucet with confidence! Remember that you can learn more about any of the models we’ve recommended here by clicking on the links in our reviews. That’s also the best way to check current prices, explore finish options, and to order from an authorised vendor. Be sure to visit our homepage to find many more reviews, recommendations, and helpful suggestions for taking your home kitchen to the next level. You can find links to all our latest content, along with featured buying guides, on our homepage at kitchenfaucets.reviews.